When it comes to keeping your mouth healthy and your smile bright, dentists may be the first health care professionals you think of. But for certain orthodontic problems, we may recommend a team approach that involves consulting a professional in another field. For example, when a persistent habit like tongue thrusting is causing trouble with your child's bite, it may be time to pay a visit to an orofacial myologist. If you haven't heard of this specialist, you're not alone. Let's take a closer look at how the muscles in your mouth work together, how problems in this area may develop, and how they can be fixed. Your oral cavity is surrounded by many muscles, including those that control facial expression, speech, mastication (chewing), and swallowing. One of the largest is the tongue, which has a prominent role in speaking and swallowing. In a normal, relaxed posture, the tip of the tongue touches the upper palate (roof of the mouth), the top and bottom teeth aren't in contact, and breathing is done through the nose. But in some people, this posture doesn't occur naturally. Instead, the tongue may rest on the “floor” of the mouth, allowing too much open space above; or it may be positioned too far forward, even protruding between the front teeth (tongue thrusting). Either of these postures can spell trouble for the bite. Tongue thrusting is a behavioral pattern sometimes found in children, where the tongue is habitually pressed against the front teeth. A related behavior, called the infantile swallowing pattern, occurs when the tongue is thrust into the gap between the front teeth while swallowing; this is a normal phase of development, but is usually replaced by the adult swallowing pattern around age four. Tongue thrusting may be instigated by many factors, including airway obstructions, low tongue posture, or anatomical irregularities. Once this behavior becomes a habit, it can cause serious bite problems. Over time, the slight, constant pressure of the tongue against the front teeth may be enough to push them forward and out of alignment. In severe cases, it can result in an open bite — a situation where the front teeth don't come together or overlap when the mouth is closed, but instead leave an open gap in the front of the mouth. This type of malocclusion (bite problem) not only detracts from the appearance of the smile — it may also make it difficult to speak, chew, and swallow properly. Correcting an open bite often requires extensive orthodontic work. 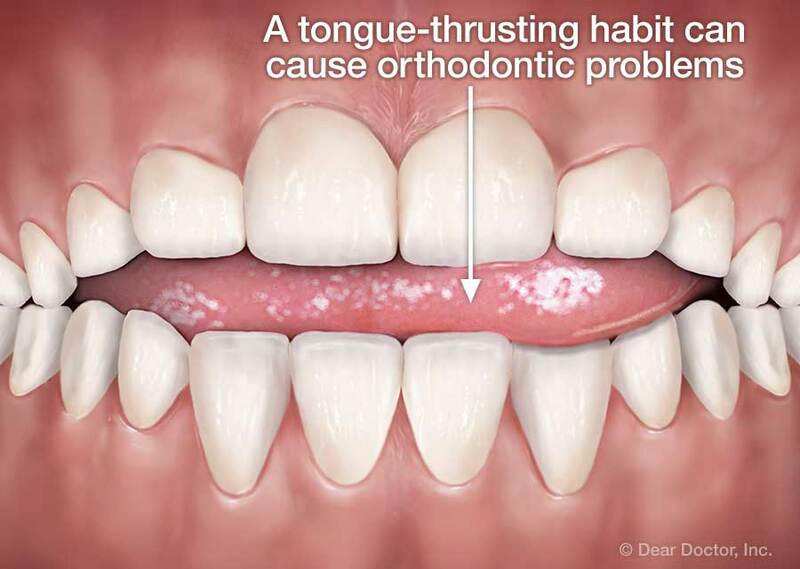 If tongue thrusting continues after orthodontic treatment is completed, the harmful habit may undo months of work; in a relatively short time, it can change the newly straightened smile back to the way it was before treatment. In fact, many young people are first referred for oral muscle therapy, technically called Orofacial Myofunctional Therapy (OMT), as their orthodontic work is being wrapped up. In other instances, OMT is recommended for treating habitual mouth breathing, persistent thumb sucking, and other conditions that affect speech, eating, and oral health. The goal of OMT is to re-train the facial muscles (including the tongue) to habitually assume the proper resting posture. A health care professional called an orofacial myologist may employ various approaches to achieve this goal, including exercises for the oral muscles combined with motivational techniques that use positive reinforcement. Some exercises are designed to accustom the tongue to resting on the proper spot on the palate; others promote good muscle tone and lip strength. An orofacial myologist may also help train your child to use the adult swallowing pattern, and encourage him or her to replace harmful habits with healthier behavior patterns. Rather than being a one-size-fits-all treatment, orofacial myofunctional therapy is tailored to each individual's needs. Following a thorough evaluation, OMT uses age-appropriate techniques (and rewards) to bring about positive changes in behavior. As therapy progresses, exercises learned in the office are often practiced at home in front of a mirror. Simple tools, such as tongue depressors, dental elastics, or even healthy snack foods, are sometimes used to help young patients develop good oral behaviors. While every situation is different, OMT typically brings improvement in a period of weeks, and is generally completed in 15-17 sessions. Orofacial myofunctional therapy is an established treatment method that can be beneficial in a number of situations. If you have questions about OMT or would like more information or a referral, please contact our office.